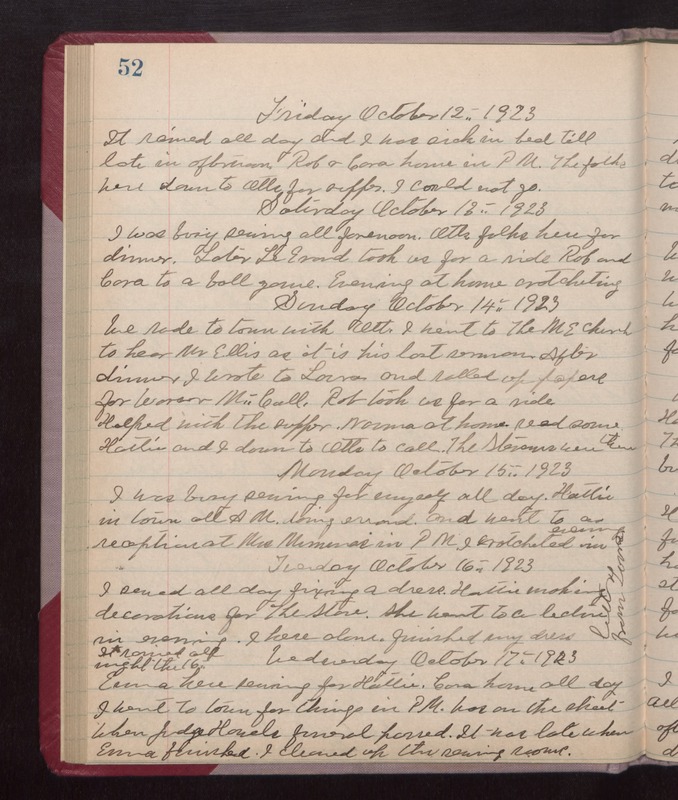 Friday October 12th 1923 It rained all day and I was sick in bed till late in afternoon. Rob & Cora home in PM. The folks were down to Otts for supper. I could not go. Saturday October 13th 1923 I was busy sewing all forenoon. Otts folks here for dinner. Later LeGrand took us for a ride Rob and Cora to a ball game. Evening at home crotcheting. Sunday October 14th 1923 We rode to town with Ott. I went to The M E Church to hear Mr Ellis as it is his last sermon. After dinner I wrote to Laura and rolled up papers for Warner McCall. Rob took us for a ride. Helped with the supper. Normal at home. Read some. Hattie and I down to Otts to call. The Stevens were there. Monday October 15th 1923 I was busy sewing for myself all day. Hattie in town all AM doing errand, and later went to a reception at Mrs [Munenas?] in PM. I crotcheted in evening. Tuesday October 16th 1923 I sewed all day fixing a dress. Hattie making decorations for The Store. She went to a lecture in evening. I here alone. Finished my dress. It rained all night the 16th. Letter from Laura. Wednesday October 17th 1923 Emma here sewing for Hattie. Cora home all day. I went to town for things in PM. Was on the street when Judge Howels funeral passed. It was late when Emma finished. I cleaned up the sewing room.